Matt Klotz, 20, from Cameron Park, California, joined the Sierra Marlins team of Folsom, and began breaking records at Vista del Lago High School. He competed in the 2013 Deaflympics in Sofia, Bulgaria. He took home two gold medals (100-meter backstroke at 58:69 and 200-meter backstroke at 2:07:43) and a bronze for the 4x100-meter individual medley. 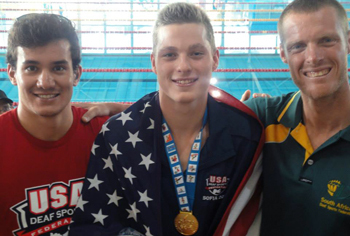 Deaflympics Swimming Team USA Head Coach Marcus Titus called him “a fantastic swimmer.” For his record-breaking achievements, USA Deaf Sports Federation named him 2013 Male Athlete of the Year. He's now attending Louisiana State University, on the Tigers' varsity swim team. Background: I am not from a deaf family. There is no explanation why; I was just born this way. It was before universal hearing screening was done on newborns, so my parents did not know I was deaf until I was two. I spoke some words, and I did everything my parents ever asked. I was able to read lips early on. My mom said that when they programmed my hearing aids and she spoke, I immediately turned my head towards her. Then my dad talked, and I turned my head toward him. They realized I had never heard their voice. I just knew how to read their lips. Schooling: I went to CCHAT (Children’s Choice for Hearing and Talking) in Sacramento for preschool from when I was two until I was five. It was about a 30-minute drive each way. It was an oral school for children, and I went based on my audiologist’s recommendation. I had daily speech therapy, and I went into the mainstream. My mom was also my kindergarten teacher. School was a struggle because some teachers were more accommodating than others. I had an oral interpreter through the eighth grade and then did high school on my own. LSU has been great at providing disability services. I have a closed-captionist notetaker in every class, as well as tutoring as an athlete. Getting into the swim: I started swimming on our local rec team when I was four because my older sister [Stephanie] swam. * When she moved to the competitive year-round team, I followed her a few months later when I was eight. I did it more for fun. Then in high school, I saw my sister traveling all over during recruiting to Division I schools, and I decided I wanted to do that too. I also heard about Deaflympics and realized I had times that would be American records so I got really motivated to break more records. Greatest mentors: My parents have been my biggest mentors. They have always believed in me and supported me in school and swimming. All my coaches over the years have helped lead to my success, but some have truly mentored. Jeff Pearson was my club coach when I finally decided to become serious about swimming and reach for goals. Then during my gap year before college, Sam King took time to develop my technique. When I got to LSU, Steve Mellor, my sprint coach, really inspired me and I got my Olympic Trials cut in just three months after returning from a medical leave. All the LSU coaches have played a huge role in my recent accomplishments. They work hard to inspire us all, and it is a great team to be a part of. Goals & ambitions: My short-term goals are to final at the SEC Championships this year and qualify for the NCAA Championships. My long-term goal would be to final at the 2020 Olympic Trials and score at the NCAA Championships for the next four years. I also want to continue to make a 3.0 GPA or higher and earn honor roll. Competing at LSU: I am very excited to compete for LSU this year. I am excited to see what our team will do. We have a great group of guys, and we are all really motivated to represent our team. Academics: My major is Kinesiology with a focus in Sports Management and a minor in College Coaching. I would like to be a college swim coach. Points of pride: My proudest achievements are making SEC Honor Roll as a freshman this past year and then reaching the Olympic Trials in swimming. I am also proud of being named the 2013 Deaf Athlete of the Year for my accomplishments at the 2013 Deaflympics. Representing Team USA is also an honor. And . . . I am excited for this year to see what I can accomplish in and out of the pool. I am looking forward to representing LSU with my teammates and then for Deaflympics next summer. * Stephanie, Klotz, Mtt's older sister, was a swimming champion at University of Alabama and participated in the 2016 Olympic Trials, finishing off a fine career. Their parents, Linda and Deaf Klotz, were at the Omaha trials to cheer for Stephanie and Matt. † Unlike Olympians, who are subsidized by their national Olympic committees, Deaflympians have to fund their own participation, which means that athletes who want to compete have to conduct their own fundraising campaigns.